Icelandair meals-Business and economy class review! Here’s a quick review of my first time flying with Icelandair. I booked a ticket from Frankfurt to New York for the Christmas holidays and decided to try out this airline. 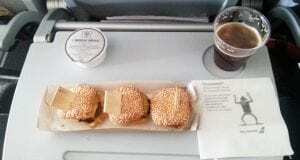 This review covers economy and Saga class meals. For a more up to date review you can also check out this Icelandair review right here. Economy class passengers on Icelandair have to buy their inflight meals no matter where you are flying to/from. There are two different inflight menus for economy class; The first for flights to and from Europe and the second for flights to and from North America. Premium economy and business class passengers can select whatever they like from the inflight menu specific to your flight. 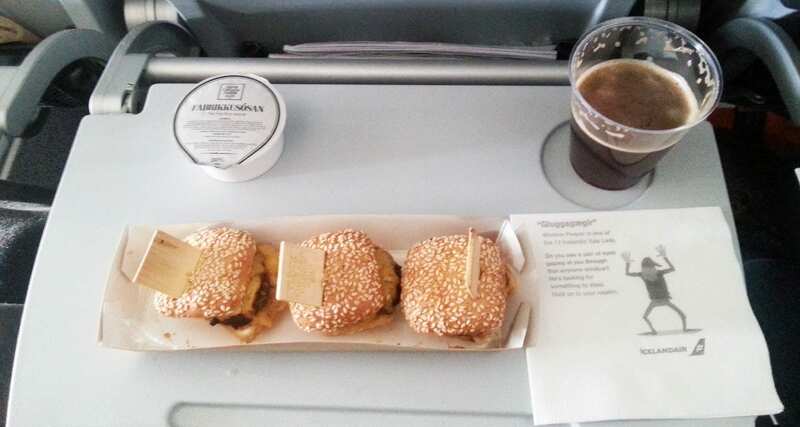 The first thing you notice on the menu is how everything looks so different to regular airline food; the packaging is intended to introduce Icelandic nature to passengers. The packaging is also meant to be as eco-friendly as possible. The second thing that you notice is how original some of the meal items on the menu are. Due to the time of the year, a special Christmas menu (in addition to the standard menu) was handed out to all passengers. The cabin crew were in the spirit of Christmas handing out free cookies to everyone on board, as well as complimentary Christmas drinks like Malt and Appelsin and Icelandic Christmas Beer. Having not been to Iceland before I was a little shocked at the prices of the onboard meals, however, if you compare them to the costs of meals locally you soon realise the prices are in line with the local market. There’re no special meals available to order so if you have special dietary requirements bring a backup! You receive three burgers plus a fabulous dipping sauce. Tasty and hard to share. Consisted of slices of turkey, ham, venison pate, herring, sauteed mushrooms and potato salad. Tasted very fresh and gives you a sense of local flavors. I thought this dish would be served cold, but it was a hot meal. This meal was probably one of the tastiest hot meal options I had sampled in a while. The chicken was tender, moist and delicious. For Saga class (business class) passengers of Icelandair, you can enjoy complimentary meals and drinks. Meals include a choice of two main courses on routes to Europe and flights to the USA, you can enjoy a selection of three meal options. Of course, there are plenty of extras to keep you comfortable inflight including amenities like hot towels, newspapers, pillows and blankets. I was given a choice of bakery items to choose from and offered bottomless cups of tea, coffee and other hot drinks were on offer too. Compared to economy class the meals were just as good if not better, and the service provided by the crew was excellent. I would happily fly Icelandair again, creative inflight menus and locally inspired dishes make for a fun inflight meal experience.